It’s the last Saturday of the month, which means it’s Give a Sh*t Book Club time! Our book this month is a classic of science fiction: Kindred by Octavia Butler. I know I’m late to the party, but I’m so glad I finally read this book! 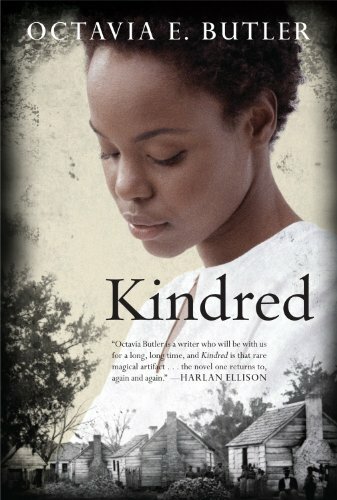 Kindred follows Dana, an African American woman living in the 1970s, as she is mysteriously flung back in time to the antebellum South. It becomes apparent that the reason for Dana’s unwitting time travel is her distant ancestor, a white boy named Rufus. Anytime Rufus gets close to death, Dana is wrenched back through time to save his life, and by extension, her own. Obviously, a black woman appearing in jeans and polyester in the middle of slaveholding territory draws a lot of attention, and Dana has to fight bitterly for survival, even working as a slave in her ancestor’s house. As Dana discovers, there’s a fine line between pretending to be a slave and actually becoming one, and it disturbs her at times how easily she is able to assimilate into the world of slavery. That’s one of the things that struck me in reading Kindred: how Dana and her husband, Kevin, found the world of the past somehow both comfortable and familiar and grotesquely horrifying. Dana muses how odd it is that when she returns to Rufus’s father’s house, she feels as if she’s coming home, even though it’s no true home for her and unimaginable cruelties are meted out to her there. Another interesting aspect to me was Dana and Kevin’s relationship. Kevin, as a white man, has to pretend to own Dana when they travel back in time together, and Dana, just by sleeping in the same room as her husband is subjected to the judgment of the other slaves and the mistress of the house. I also thought Kevin’s occasional inability to understand Dana’s point of view was striking, but probably realistic. Although he cared about his wife deeply, he couldn’t truly know what it was like for her to live as the property of another person, and he needed to work to grow his empathy so that he could understand her. Finally, I have to say something about that ending! At the beginning of the book I never would have guessed how Dana’s mission with respect to Rufus would change. She was so focused on how she could keep Rufus alive that it didn’t occur to me until very late in the book that eventually, to ensure her other ancestors’ safety, she might have to kill him. When she did, though, it felt inevitable to me, like there was no other choice for her to make. It was like the decision you make to shoot a rabid dog. Dana needed to put Rufus down. His life and his family had poisoned him past the point of recovery, and ultimately she needed to protect herself. So what did you think of Kindred? Comments are open below, and will stay open for a couple weeks. Can’t wait to hear your thoughts!